Disney (DIS - Get Report) is set shake up the streaming world on Thursday with with its long-awaited Netflix (NFLX - Get Report) competitor. There's a lot we don't know about Disney's new Disney+ direct-to-consumer streaming service -- namely price, a specific launch date and what original content Disney will offer alongside its own TV and film library. We also don't know how it might be bundled with content from Disney's other streaming properties, ESPN+ and Hulu. But the new service could prove tempting to cord-cutters who will soon have more choice than ever in where to get their content. Disney is scheduled to preview Disney+ at an investor day this Thursday starting at 5:30 p.m. ET, making it the newest entrant into an increasingly crowded market for streaming services. Netflix is the dominant player, at 139 million subscribers as of its last earnings report. Apple (AAPL - Get Report) aims to leverage its installed base of 1.4 billion in Apple TV channels and TV+, its recently announced à la carte streaming services. AT&T's (T - Get Report) WarnerMedia is expected to launch its own service this year, and of course Amazon (AMZN - Get Report) Prime Video has been folded into its Prime subscriptions for years. On Wednesday, BMO analyst Daniel Salmon upgraded his rating on Disney to outperform from market perform based in part on optimism about Disney+. "We continue to like Netflix and Amazon more than Disney, but are comfortable recommending all three, as we expect them all to be long-term winners in global streaming," Salmon wrote. BMO's upgrade followed one on Tuesday from Cowen analyst Doug Creutz, who cited the strength of Disney's content pipeline in arguing that the company could ultimately realize "Netflix-like valuations" in its streaming business. "We believe the Disney+ DTC (direct to consumer) service is well positioned to have an extremely strong launch that surpasses consensus subscriber expectations," Creutz wrote. Based on what we know now of Disney+, an important draw will be Disney's sought-after brands and franchises, such as Marvel, Pixar, Star Wars and National Geographic, that will be offered alongside original content. Whether Disney+ will chip away meaningful market share from Netflix and other players over time, or coexist as another streaming option, is another question. Cost will be a major factor in how Disney+ stacks up. Pricing isn't yet known for Disney+, or Apple's TV+, or the others set to launch in the coming quarters. 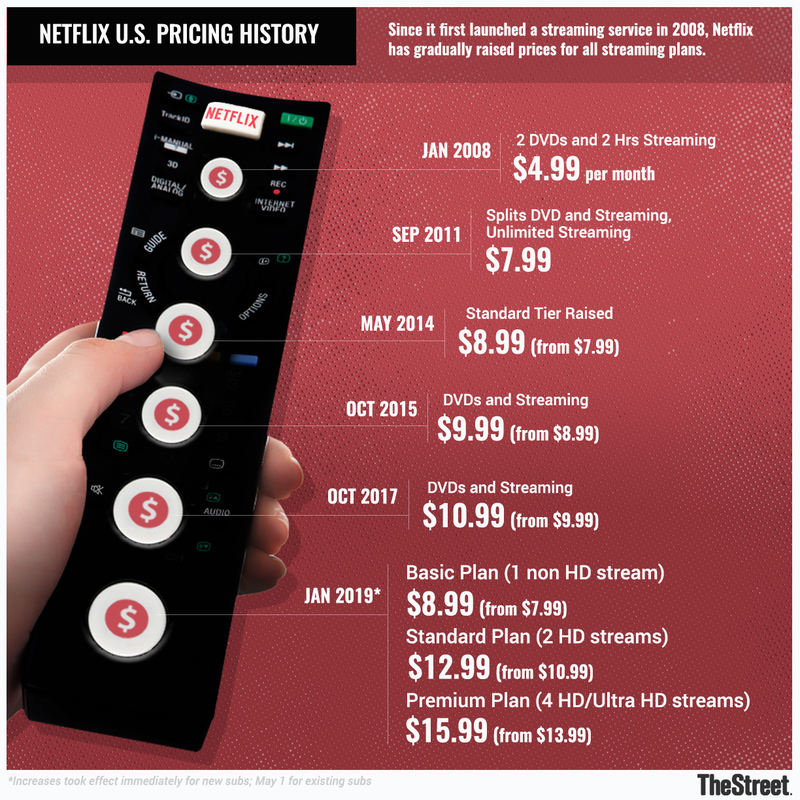 For its part, Netflix hiked its prices this year -- to $9 from $8 for a Basic plan, $13 from $11 for its most popular Standard plan, and $16 from $14 for its Premium plan -- and many analysts speculate that Disney will undercut Netflix on pricing for Disney+. Customers may eventually reach a point where they have to pick and choose what content they really want for their money. And we don't know yet how that will shake out among the various players. "With the arrival of new big-named competitors in the [subscription video on demand/direct-to-consumer TV] space, we're about to learn a lot about price ceilings and floors for these services," Michael Greeson, president of The Diffusion Group, told TheStreet this month. "Much will depend on the composition of the new services (e.g., just how much content Disney packs into its subscription) relative to their cost. If Disney comes in around $9/month and offers a robust library and slate of originals, that will make it more difficult for Netflix," he said. 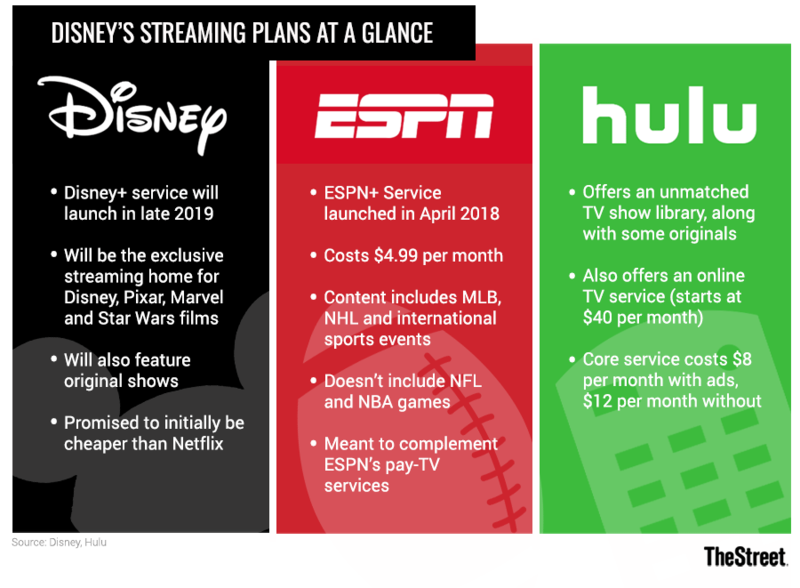 Meanwhile, Morgan Stanley analyst Benjamin Swinburne recently raised his subscriber projections for Disney+, forecasting 70 million subscribers by 2022 for Hulu, Disney+ and ESPN + combined, and citing a survey which found that 40% of U.S. adults expressed some interest in Disney+ at a hypothetical price point of $8 per month. "Against a U.S. broadband base of 100mm households, this suggests over 40 [million] subscriber opportunity in the US alone," Swinburne wrote. Apple, Amazon and Disney are holdings in Jim Cramer's Action Alerts PLUS member club. Want to be alerted before Jim Cramer buys or sells AMZN or DIS? Learn more now.